This book addresses selected aspects of steel-deformation modelling, both at very high temperatures and under the conditions in which the liquid and the solid phases coexist. Steel-deformation modelling with its simultaneous solidification is particularly difficult due to its specificity and complexity. With regard to industrial applications and the development of new, integrated continuous casting and rolling processes, the issues related to modelling are becoming increasingly important. Since the numerous industrial tests that are necessary when traditional methods are used to design the process of continuous casting immediately followed by rolling are expensive, new modelling concepts have been sought. Comprehensive tests were applied to solve problems related to the deformation of steel with a semi-solid core. Physical tests using specialist laboratory instruments (Gleeble 3800thermo-mechanical simulator, NANOTOM 180 N computer tomography, Zwick Z250 testing equipment, 3D blue-light scanning systems), and advanced mathematical modelling (finite element method (FEM), SPH smoothed particle method, cellular automata method CA) were used. 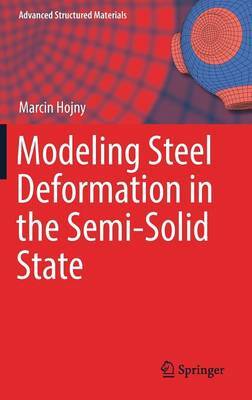 This book presents in detail a modelling concept for steel deformation in the semi-solid state based on an approach integrating physical and computer simulations with a full or partial information exchange between these areas.